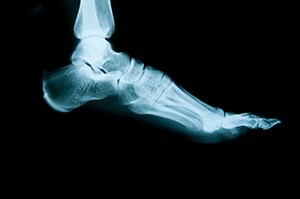 Stress fractures of the foot and ankle are common injuries we treat at Richardson Podiatry Associates. Anyone can be at risk for developing this ailment, so it is important to understand the condition, especially the symptoms and preventative measures you can take to decrease your risk. When you walk, run, or jump, your lower body bears the stresses that come from the weight of your body. With this being the case, it is no surprise that stress fractures are more commonly found in the foot, ankle, and lower leg. A stress fracture is a slight crack that develops in one of your bones. This ailment is seen frequently in track and field athletes, but you certainly do not have to participate in sports to develop one. Pain – This is the main symptom that you will be able to observe on your own. It will likely start out as barely noticeable, but then increase in intensity over time, especially when you are physically active. The pain will typically subside when you rest. Swelling – The area where you experience pain will often swell, which is almost always a visual cue that your body is trying to address something that is wrong. Tenderness – Much like pain, the tenderness that accompanies this ailment will be more prevalent during and following activity, but will diminish with rest. Unlike in the case of a more traditional break, it is rare to see bruising or discoloration. Do not expect these to be displayed as symptoms, but be aware that they are experienced in rare cases. Also, note that these symptoms are similar to the ones for a sprained ankle, so it is important that you visit Richardson Podiatry Associates to receive a proper diagnosis. Stress fractures are common overuse injuries. The repetitive forces combined from gravity and your bodyweight take their toll on the bones in your lower extremities. This is then coupled with the natural process in your skeletal system of continual resorption and growth of new bone tissue. See, on a cellular level your bones are constantly discarding and regenerating tissue, but putting too much force on a bone before it’s had a chance to recover will cause fatigue. Tired bones are more likely to develop the tiny cracks that become stress fractures. In addition to physical activity, your bones may already be “fatigued” from an existing condition like osteoporosis. This is why stress fractures are not limited simply to athletes and active individuals. Preventative steps can be taken to help avoid the issue in the first place. Stress fractures often accompany an attempt to start a workout program by doing “too much, too soon.” If you are considering starting, or recently have begun, a new exercise regimen, take it easy at first and gradually build up your intensity, duration, and frequency. Also, give some thought to cross-training. Incorporating low-impact activities like bicycling, swimming, and yoga will give your bones a chance to recover. Finally, don’t forget about nutrition! A daily diet rich in calcium and other nutrients will lead to healthy bones that recover quicker. When it comes to a broken bone of any severity, your body is going to undergo natural processes to repair the damaged tissue. With that being the case, treatment is centered on ensuring that it happens in the proper fashion. We will examine the affected area, provide instructions for keeping your bodyweight off it, and help you manage the swelling and pain. Richardson Podiatry Associates is experienced in dealing with stress fractures of the foot and will effectively help you when you experience this condition. Schedule an appointment with our Richardson, TX, office by calling (972) 690-5374 or using our online form today. ?Is it possible for a bone to break in the middle of your foot?